I remember watching an episode of Masterchef in 2013 when the idea for this recipe came to me. Taking into account the joy and texture of corn, with delicious salty, nutty and soft elements all thrown in for good measure. There is no surprise to know that green leafy vegetables are good for us, we have been hearing this for years. Kale however, despite its long list of pros, gets a bad wrap, especially when eaten raw. Better still, I think this recipe will go a long way to changing that for you. So what is the deal with kale then? Yes it is featured in supermodel’s green smoothies, trendy cafe menus and organic farmer’s markets shopping lists and rightly so… It is pretty freaking special! A simple Google search returns over 19 million results. People are clearly crazy for kale! Plus it is cheap and easy to prepare… need I go on? Even if you’re a sceptic, give this a try and let me know if you feel any differently towards kale. Make double or triple of this one and enjoy leftovers tomorrow – the recipes stores well! 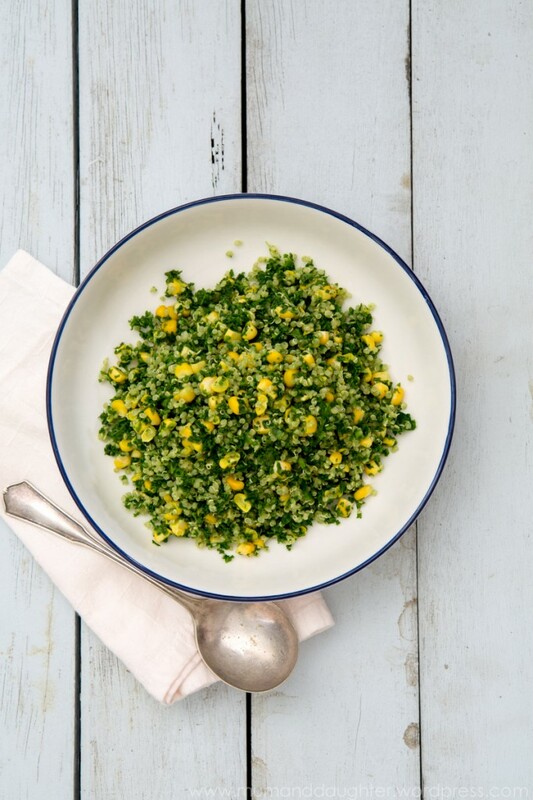 4 Responses to "A bowl of perfect – Kale, Corn & Quinoa salad"
Sweet corn! It is experiencing that last summer blast in the USA, and starting to come through in Aus. With moderate amounts of Oligos – GOS and high levels of the Polyol sorbitol, a full cob will set you back if you malabsorb or react badly to these FODMAPs. That being said, we all know IBS is all about serving size! One HALF cob (43g of kernels) should be tolerated by most individuals. And this simple salad is light, fresh, warming and goes brilliantly with chicken breast rubbed with lemon zest, cumin and a little salt, fried in a olive oil. I haven’t made this yet however it’s on my list of recipes for this week. Just wondering Nadia if you have ever tried it with grilled corn?? I’m a little obsessed with grilled corn at the moment. Love the charred flavour and it seems to go with almost any dish! Perfect idea Steph and you’re making me salivate with this! I’ve not tried it myself though it would certainly work well here – enjoy!